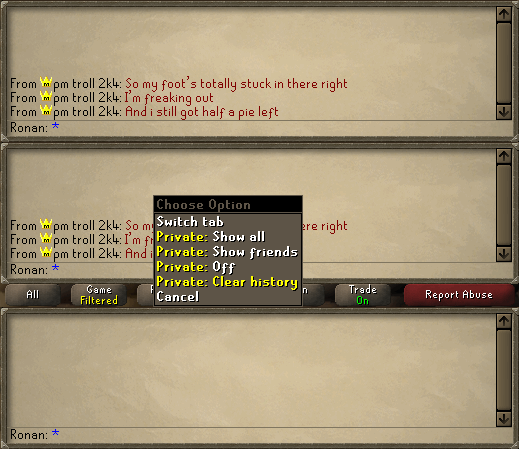 In this week's Old School update we've got a new private chat feature to clear your private message history. We've also got a new options menu for graphics and interface settings to help keep the settings tab nice and simple. Let's jump into the details. You can now clear your private message history by right clicking the private chat stone beneath the chatbox and selecting 'clear history'. This can be used to quickly and easily clear up any old private messages that are lingering for a bit longer than necessary. With the release of resizable mode the settings tab was getting a little full. In order to reduce clutter in the menu, and to allow more room for more graphics toggles, we've separated out some interface and graphics options into an 'advanced options' menu. You can access this by clicking the 'advanced options' button found inside the settings tab. As can be seen in the above screenshot, we have also added two toggles. 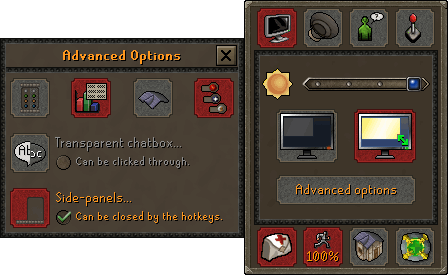 You can now decide whether or not you'd like to be able to click through your chat box or whether hotkeys can be used to close side-panels when using resizable mode. We've got a lot of other feedback changes we'd like to make for resizable, including the popular requests for a zoom control or scaled-up versions of the chatbox, interfaces and minimap. Ian's been working hard in his personal time towards these; however, they are larger jobs, and will take longer to implement. We'll keep you updated on the progress of these features in the coming weeks. • Green and blue dragonhide chaps (t) are now trimmed correctly around the left thigh. • Fixed an issue with line breaks on some interfaces. • You can no longer place a cannon by the start of the Seers' agility course. • Catching fish in Catherby for the Kandarin achievement diary now completes the tasks more reliably. • Added game messages for making herb tars to the game filter. • The transparent chat-box arrow buttons can no longer be clicked through. • Fixed an issue with prayer draining and the cannon. • Fixed a stretching issue with the runite crossbow. • Optimized the chat box to improve FPS. • You can no longer spam the beacon ring to constantly spawn Zaff. • Added requirement information to the 5th slayer block slot. • Scarecrows now have a left-click remove option when a patch is weeded. • 'Membership bonds' have been renamed to 'Old School bonds' to help prevent people purchasing the wrong type of bond. In case you missed it, the first developer blog for deadman mode went up yesterday. If you're curious about the proposed new game mode, be sure to give it a read by clicking here. We're looking for as much feedback as we can get. Don't hold back! This sounds interesting, what was the issue?